Es Calo is home to a small perfectly formed harbour surrounded by boat houses and a couple of small round beaches that are only a short stroll from the car park and restaurants. The shoreline has great views towards La Mola and is made up of 2 main sandy beaches. Amore beach bar is located on the northern beach, so perfectly located for drinks and snacks. There are umbrellas and sun loungers for hire in front of the beach bar. Further along the coastline from the beaches are many rocky inlets where it is possible to find your own private spot to lay in for the day. Es Calo is one of the best spots on Formentera to snorkel due to the abundance of rocky outcrops and weed that many species of fish like to call home. There are 3 restaurants in Es Calo, including the fantastic Restaurante Es Calo, which is great for evening meals, and Hostal Rafalet which serves nice pizzas & snacks and is ideally located for pre dinner drinks while overlooking the pretty harbour. There are 2 supermarkets close at hand, and there is free parking here if you can find a space. 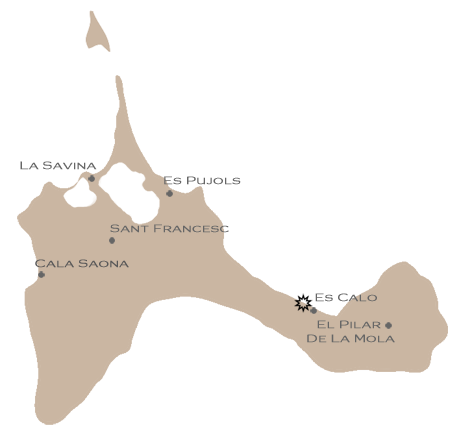 Es Calo is easy to find as it is located along the main road to La Mola from San Ferran. To get to the car park at Es Calo, take the first driveway on your left, after the speed hump, coming from the direction of San Ferran. The car park can fill up fast during summer. Our closest villa to here is Casa Es Calo. 3 km to Playa Es Calo. 2 km to Playa Es Calo. 7 km to Playa Es Calo.